Bandelier National Monument is an unexpected delight, containing some of the most unusual and interesting ancient ruins in the Southwest, petroglyphs and pictographs, steep narrow canyons with plentiful wildlife, mountains rising to 10,200 feet, many acres of unspoilt backcountry and a colorful section of the Rio Grande valley. The monument is just a few minutes drive from the scientific research town of Los Alamos, and close to other popular destinations including Santa Fe, the Jemez Mountains and several historic pueblo settlements. 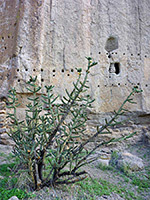 Visitor activities are concentrated in a short section of Frijoles Canyon, a 400 foot deep, sheer-walled gorge, as here are found the main ruins, but a network of lightly-used paths heads south and west to other ancient sites, while some higher elevation areas are accessible from Hwy 4 to the north. In recent years the canyon has been affected by several huge flash floods, one of which permanently closed a popular trail that used to lead all the way to the Rio Grande. The approach to Bandelier is along Hwy 4 - either from the west, across the pretty, wooded country of Valles Caldera and the Santa Fe National Forest, or north and east from the Rio Grande valley via Los Alamos, a road which passes a number of secretive laboratories, well hidden in the thick forest and protected by high fences. A short side-road forks south at the entrance to the national monument, passing along the top of a ridge that gives good views over the valley beneath, then descending steeply into Frijoles Canyon, ending at a visitor center with somewhat limited parking facilities. Space is at a premium in this narrow valley, and in summer the parking area is only open to private vehicles if arriving before 9 am; later arrivals have to use a free shuttle system, starting from a larger parking lot on the canyon rim. The 66-site Juniper Campground, for tents and RVs, is also located on the plateau, where there is much more room. 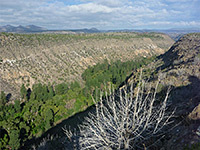 Frijoles Canyon has been created by Frijoles Creek, eroding through thick deposits of volcanic rock - mainly tuff, which is full of natural cavities - originally air pockets in ash deposits from volcanic eruptions several thousand years ago. These may be ten or twenty feet in diameter, and were used by the Anasazi peoples between 700 and 450 years ago as the basis of their villages. Selected cavities were enlarged, linked together and augmented to form numerous clusters of dwellings extending over several miles of this rocky land southeast of the Jemez Mountains. The ash originated from volcanoes at the site of Valle Grande Peak, a few miles west. Hot springs in the nearby forests still hint of continuing subterranean thermal activity. Together with some more conventional ruins along the canyon floor, many of these unusual dwellings are just a short walk away from the national monument visitor center, and a 2 mile loop path (with an upstream extension to the Ceremonial Cave, or Alcove House) allows for easy viewing. The entrance road follows a narrow promontory bordered by Chaquehui Canyon on the east side, then drops down into the larger Frijoles Canyon to the west, ending at a shady parking lot lined by tall trees and quite a few buildings, including Frijoles Canyon Lodge, a historic, Spanish pueblo-style residence constructed in the 1930s. 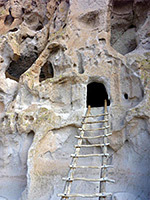 The whole complex contains over 30 structures, all protected as Bandelier CCC Historic District. Today, facilities include a visitor center, museum, bookstore, gift shop and snack bar. Paths lead upstream to the main ruins, downstream to Upper Frijoles Falls and west into the extensive backcountry. 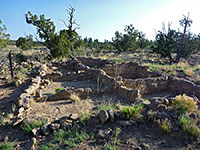 a remote location with many large well-preserved structures, Aztec Ruins near Farmington, and the Gila Cliff Dwellings, further south in the Mogollon Mountains. The nearest towns with hotels close to Bandelier National Monument are Espanola (26 miles), Los Alamos (12 miles) and Santa Fe (40 miles). 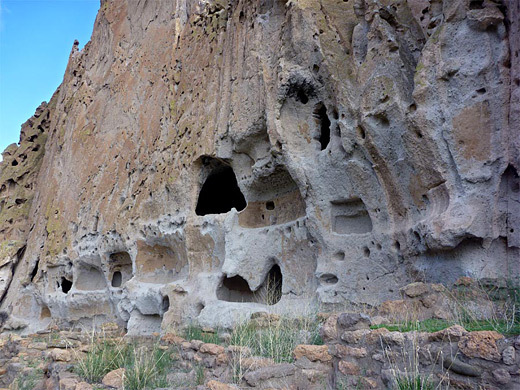 Ancient dwellings carved into light-colored volcanic cliffs, at the edge of a narrow, wooded canyon - a tributary of the Rio Grande. The extensive backcountry includes other ruins and a great variety of landscapes, spanning over 5,000 feet of elevation.